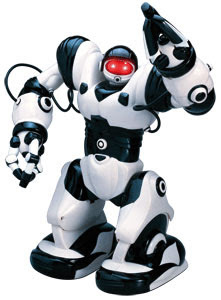 Robosapien™ is a sophisticated fusion of technology and personality. Loaded with attitude and intelligence, Robosapien is the first robot based on the science of applied biomorphic robotics. With a full range of dynamic motion, interactive sensors and a unique personality, Robosapien is more than a mechanical companion -- he's a multi-functional, thinking, feeling robot with attitude! Like other WowWee robots, the Roboquad has multiple 'personalities' which are dubbed 'States'. Those states are State of Awareness, State of Aggression and State of Activity, and they can each be set to low, medium or high. In the Awareness state, it spends more time scanning its surroundings. When its Aggression state is increased, its behaviour simulates anger and aggression and finally the higher the Activity state, the further and faster the Roboquad will wander. With its light, sound and IR sensors, Roboquad is pre-programmed to simulate reactions to external stimuli and acts accordingly. The Roboquad's legs all swivel around and so it is able to walk forward, backwards and sideways at about the same rate and mobility. Its head is also able to swivel around completely, so it is able to scan its surroundings without turning its body. In addition to its adjustable personalities (States), Roboquad's 5 different scanning sequences (described above in Features) are modulated according to how the personalities are tuned. The documentation states that Roboquad's infrared sensors are sensitive enough to allow it to navigate doorways. The toy is capable of a walking motion without recourse to wheels within its feet. It is also able to grasp objects with either of its hands, and is also able to throw grasped objects with mild force. It has a small loudspeaker unit, which can broadcast several different vocalizations, all of which appear to be recordings of a human male pretending to be a great ape, such as a gorilla. Or it can fart or belch very loudly. penambahan ads dari google dan penambahan custom search dari google yang bisa mencari 3 domain sekaligus, rosesana.com , rosesana.indonetwork.co.id, rosesana.indonetwork.net. 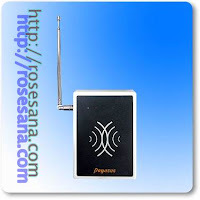 RFID Proximity advanced long range reader,PFH-9210-300 Proximity hand free system with High technologies performance for 3 meters. PFH-9210-60 Proximity reader for 60 cm distance. The Pegasus PFH-9210 system is an advanced and Hi-technology reader for vehicle or personal access application.